The Polestar 1 will launch in 2019. 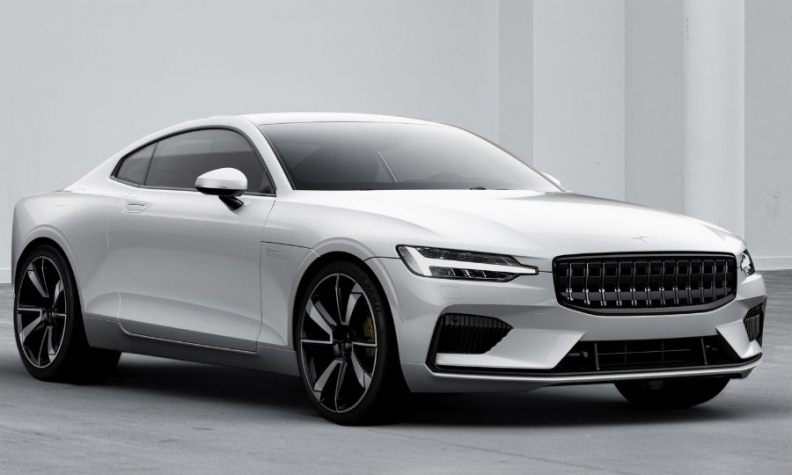 SHANGHAI – Volvo Cars' Polestar division will build electrified cars in China for global markets, starting with the Polestar 1 high-performance plug-in hybrid coupe. The 600-hp Polestar 1, which launches in 2019, can be driven up to 150 km (93 miles) on electric power only, the longest full-electric range of any hybrid car so far on the market, Polestar said in a statement Tuesday. The midsize coupe will go in production in the western city of Chengdu in mid-2019, as a low volume, halo car for the Polestar brand. It will be followed in late 2019 by the full-electric Polestar 2 sedan and later by the Polestar 3 SUV. Volvo bought the racing-focused Polestar brand in 2015 and is turning it into a global marque producing electrified high-performance models to challenge the likes of Tesla and BMW’s i subbrand. Volvo and parent Geely Holding will jointly invest 5 billion yuan (640 million euros) to support the initial phase of Polestar’s product, brand and industrial development, Polestar said in the statement. "The investment highlights the financial muscle and industrial and manufacturing expertise Polestar will have access to, and establishes the fully consolidated Volvo Cars subsidiary as a stand-alone electrified performance car company," the statement said. The Polestar 2 will be the first full-electric car launched by Volvo and the first of five full-electric Polestar- or Volvo-branded vehicles to be launched between 2019 and 2021. In July, Volvo said all its new models launched from 2019 onward will be electrified, either with various levels of hybridization or pure battery power. Though Polestar has been spun off as an independent brand, it will operate under Volvo, which was bought by Zhejiang Geely Holding in 2010. The Polestar 1 shares technology and much of its styling -- such as the Thor's hammer headlights -- with Volvo vehicles. About half of the technology under the skin is based on Volvo’s in-house SPA modular architecture, already used in models such as its XC90 large SUV and S90 large sedan and in the second-generation XC60 midsize SUV. The other half is new and bespoke technology created by Polestar engineers working within Volvo’s r&d department. Polestar said it will benefit from having privileged access to Volvo’s global manufacturing standards and purchasing organization. Both Polestar models will be built in Volvo’s Chengdu plant in central China that already makes the 60-series models for China and export. The Polestar 1 is a two-door, 2+2 model that is similar in size and features to the BMW 6-series coupe. Polestar did not detail the Polestar 1’s battery size or its gasoline engine specifications. Press reports suggest it will be equipped with an evolution of the 2.0-liter, four-cylinder twin-turbocharged engine used in the XC90 plug-in hybrid variant. The XC90 plug-in’s engine delivers 320 hp and the electric motor provides 87 hp for a total output of 407 hp. Its 10.4 kWh battery gives it a 43 km electric-only range. The Polestar 1’s potential nearest rival, the BMW i8 plug-in hybrid two-seat coupe, has a total power output of 363 hp, with 37 km of electric-only range and a total range of about 500 km. The Polestar 1 will be produced in low volumes but the subsequent models will be "mass produced," Volvo's CEO Hakan Samuelsson said at the car's unveiling in Shanghai. A maximum of 500 Polestar 1s will be built a year. Customers can pre-order the vehicle starting Tuesday, Oct. 17. The Polestar 2 will be a midsize sedan that is expected to compete with the Tesla Model 3. It will be followed by the Polestar 3 full-electric SUV, priced between the Polestar 1 and the Polestar 2. Polestar said it will also move away from the traditional ownership model with its cars will be offered on a two- or three-year subscription basis. The sales model echoes the Care by Volvo service Volvo announced with the introduction of the XC40 compact crossover. Customers can buy vehicles online. For a no-deposit flat monthly fee, they can receive delivery, maintenance, insurance and the option to rent other Polestar or Volvo vehicles. Once the two- or three-year term is complete, Polestar will pick up the vehicle and allow customers to choose a new model. The subscription includes on-demand concierge services via a mobile app -- such as installing a temporary roof storage box for a road trip -- that can be added to the monthly fee. Polestar customers also have access to the phone-as-a-key feature, allowing them to share access to their car with concierge drivers and service technicians, as well as access rental vehicles. Though transactions can be completed entirely online, Polestar will also operate brick-and-mortar sites outside of Volvo dealerships for prospective customers, called Studios. The first store is set to open in the first quarter of 2019 and Polestar plans to have 80 worldwide. Volvo dealerships will handle vehicle service. Polestar said it had not yet set the monthly fee for the Polestar 1. Executives said it would reflect the fact that a similar car on the market now would cost between 130,00 and 150,000 euros ($153,000-$176,000). Volvo picked China as the production base for Polestar because, it said, China is the "driving force behind the electrification of the global car industry." Samuelsson said there was huge demand for premium electric cars in China, but added a lot of others players were moving into the market, raising competition. "In electric high-performance cars there are a lot of companies now in this start-up arena, so we will have company," he said. China has set strict quotas for electric and hybrid vehicles that carmakers need to hit by 2019 and has begun looking at an eventual ban on the production and sale of cars using fossil fuels. The government has said it wants electric and plug-in hybrid cars to make up at least a fifth of Chinese auto sales by 2025, spurring a raft of investment plans from global automakers in electric vehicles. Samuelsson said China's aggressive push towards EVs was positive, though he disagreed with the prescriptive nature of the quota system. He said the government would need to work cooperatively with carmakers to make the shift work. "You cannot do this alone. We cannot build up (for example) the charging infrastructure in China; developing the tech, the politicians can't do either," he said.